Dental Extras. Use It. Don’t Lose It. 46% of Australians have private health cover. If you are one of that 46% – are you making the most of your health insurance? In most cases, unused private health cover benefits don’t roll over to the following year, so if you don’t use them, they are gone forever. 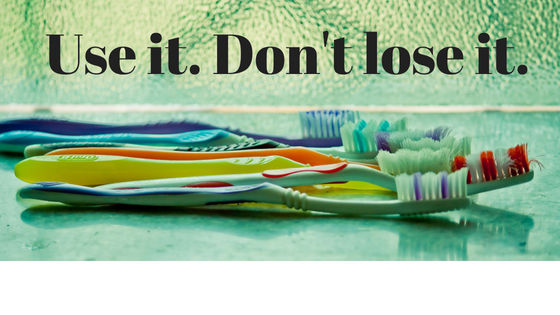 Check with your health fund to see what dental benefits you have and if they expire on a calendar year basis. And understand what you are entitled to. Exactly what is classified as preventative, general or major varies from one health insurance provider to the next. So please check your own private health insurance to see what you are covered for. Delaying simple treatments when first detected could potentially be more expensive later. Prevent costly and serious treatments by making use of your dental insurance when the problem first pops up. Prevention is the key. Keep your oral health on track. Preventative appointments, including 6-month check-ups and cleans, are typically covered by your insurance. The gap is the difference between the price of a dental treatment and what your insurer will pay. You pay the gap ‘out-of-pocket’. Every private health policy is different so have a good read of your policy. Do some research when looking for the best Private Health cover to suit you and your family. Ask about your annual limits for extras. And think about whether you are paying for extras you will just never use. Ring your fund. Shop around. Maximise your policy. At Taree Dental Care, we are passionate about providing quality dental care that is as affordable and accessible as possible for singles, couples, and families. Take an hour out of your busy schedule before the end of the year to use the benefits you are entitled to. Don’t let the rest of the year slip by without seeing us! Remember: You’ve PAID for these benefits. Use them, don’t lose them! Give our Taree Dentist a call on  (02) 6550 0960 to make an appointment. We promise to look after you.